With the holiday season in full swing, you’re bound to see downtown streets adorned with twinkling lights, houses bejeweled with festive decorations, and an omnipresent jingle of Christmas carols. Whether you’re one of those Christmas enthusiasts who goes all out for the holidays (think: a Taylor Swift-inspired light show and over-the-top inflatable Christmas displays) or you prefer a more subdued celebration, we can all agree on some Christmas decorating basics. A few nice candles, perhaps an evergreen wreath, and of course, Christmas stockings hung by the chimney with care all capture the sentiments of the holidays in a cozy, welcoming fashion. And after all, you’ll want your fireplace looking festive and cozy for when Santa Claus comes down for a visit. A fireplace mantle is a traditional focal point for displaying Christmas décor, including garlands, holly, pictures, Christmas cards, and of course, stockings. These days, a see through fireplace can play that same role while adding a simple, modern, or classic look to your home. See through fireplaces create a multi-dimensional design that can open up your space, transition between multiple rooms, and add a touch of holiday glow to the areas that you and your family gather in the most. 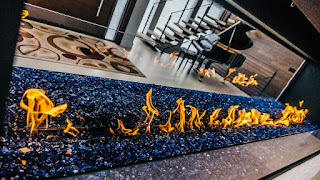 To ensure you’re 100% pleased with the results, seek out a company that offers completely customizable fire features and can accommodate any size or shape preference. 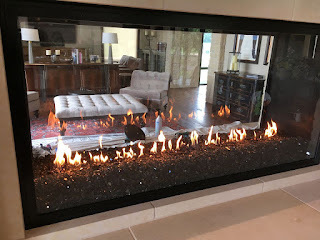 Ideally you’ll also have the option to design a fireplace with an open flame, glass sealed, or partial glass and with glass cooling or an air shield, as well as with reflective porcelain panels within the fireplace to enhance the beauty of the flames. Whether you’re looking to upgrade your space with a new fireplace feature, or you already have a beautiful see through fireplace, there are some timeless safety rules when it comes to decorations. Follow these guidelines from the Chimney Safety Institute of America to make sure your holiday decorations are both festive and safe. Both the Chimney Safety Institute of America and the National Fire Protection Association recommend keeping all combustible materials at least three feet away from a fireplace, wood-burning stove, or space heater. However, if you’re a Christmas purist and the three-foot rule just isn’t going to work, simply remove the stockings when you plan to have the fire going and replace them when the fire is out. This can help keep you, your family, and your house safe while also providing a festive holiday feel. Gas fireplaces are typically lower maintenance than wood burning fireplaces, but it’s wise to clean the area around your fireplace before hanging any decorations. Consider cleaning around the fireplace before hanging any decorations, and remove any dirt, dust, or debris from the inside of the fireplace. With the beautiful decorations and lure of hidden presents, children might be tempted to hover around a gas or wood fireplace and admire the features. Consider attaching fireplace safety gates, a fireplace screen, or an attachable safety screen to keep children at a safe distance. This can help make sure children do not get burned, and you can easily remove the gate when the fire is out. Custom designing a fire feature that incorporates glass cooling technology can also help keep little ones safe. Acucraft Fireplaces designs one-of-a-kind fire features that are sure to be the focal point of your space. With a focus on innovation, collaboration, and advanced technologies, Acucraft Fireplaces will work with you to create the simple, modern, or classic fire feature you envision with their team of skilled fireplace advisors and designers. 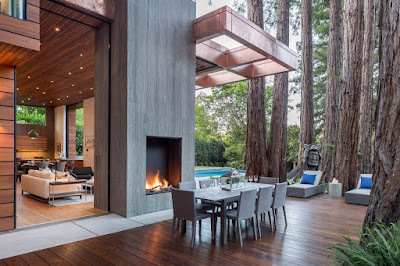 Whether you’re in search of a traditional gas burning fireplace or an ultra-modern outdoor gas fire pit, Acucraft Fireplaces’ collaborative team will help you create the perfect fire solution for your space. If you haven’t heard of this home design trend that’s been taking the world to a cozier place, it’s time to experience the Danish lifestyle in your own home. Hygge (pronounced “hoo-gah”) roughly translates to creating a cozy and joyful space for you, family, and friends. It doesn’t rely on a specific season or aesthetic but definitely comes in handy during chilly months and homey holidays. Experience hygge in your home by upgrading your common area spaces and personal sanctuaries with these soul-warming, luxurious features. The Danish home decor style traditionally, and contemporarily, relies on chic neutral colors. Add touches of green, pinks, and blues to accent the earthy tones that are your home decor basis. These can help make the gray weather outside less dull and create a cozier space without needing to overall your home design theme. 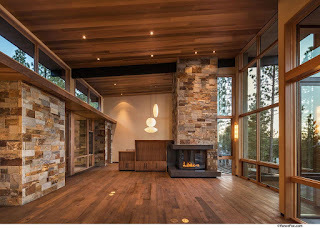 People choose a wood burning fireplace for many different reasons. Whether they want to heat their home with it, cook over it, or just want the simple pleasure of sitting and listening to the wood pop and crackle, a wood burning fireplace can do it all. The thing is, not all wood will produce the same results with some types better for certain situations. So, if you know what you enjoy most out of a fire and want to make sure you’re getting a consistent experience every time, here are the woods to look for. If you want to maximize the heat your fireplace puts out, then using the right wood is a must. Specifically, you should choose a seasoned hardwood like Ash, Hickory, or Oak. Hardwood is best for fires you want to last for hours because they take longer to burn and put off almost twice as much heat when compared to softwood. As summer transitions into autumn, the leaves start to fall and the weather gets chillier. But that doesn’t mean the party has to move indoors until spring. Upgrade your backyard patio with some of these luxurious features to entertain outdoors well into the fall months. Most of these additions work well for year-round outdoor entertainment, too, making them well worth the investment. S’mores aren’t just for summer months anymore. An outdoor gas fire pit will keep your gatherings warm during cooler months and provide the perfect setting for beautiful, chilly nights any time of the year. Choose a model that fits with your patio aesthetic, whether that’s a circular fire table or an arc-shaped design. Provide seating around the gas fire pit that makes it easy to relax and have a conversation while enjoying the warmth. Acucraft has been the premier designer and manufacturer of wood, gas and outdoor fire solutions since 1979. Our dedication to innovation, honesty, excellence, and hard work ensure we can provide solutions to each and every one of our customers. We work with some of the nation's top Architects, Designers, General Contractors and Builders. We design + create unique, one-of-a-kind custom products as well as "standard" products.